May 2018 - Present: Contracted to work on corporate identity, content and client relations for TechGDPR. TechGDPR consults companies working in AI, blockchain, IoT, and cloud computing in order to help them achieve reliable compliance with the European Union’s 2018 General Data Protection Regulation (GDPR). In support of their consulting, my focus is on generating relevant blog and website content, as well as cultivating a clear visual identity for their brand. Other responsibilities include improving the design of internal documents and written proposals. March - April 2018: Contracted design and concept development work for YPTOKEY, a startup developing encrypted key-sharing technology for use on mobile devices. I worked with the team at YPTOKEY to create B2B and B2C infographics and texts for pitch decks and brand materials. The result was a clear and concise value proposition that accurately and compellingly conveyed the strength of their product and their business model to key stakeholders and potential partners. December 2016 - April 2018: Cresco Capital Group is an integrated real estate investor and developer, with offices in Germany, England, Luxembourg and Isle of Man. I worked on editorial content and content strategy for websites, campaigns, sales materials, videos and interactive digital platforms during the launch process of their two German residential brands – Neon Wood and Tannhaus. During the production of web content (pictured below) it was my responsibility to ensure that my written content was well coordinated with the marketing team's UI designer and that all editorial content not only distinguished the brand, but increased conversion rates on their online booking platform – A platform where I also wrote the user prompts and email templates. The Above Images are the property of Cresco Capital Group and can be viewed on their Neon Wood and Tannhaus websites. August - December 2017: Founded in Berlin, Dataconomy is an online portal for news, events and expert opinion in the fields of Data Science, IoT, Machine Learning and AI. As the editor at Dataconomy, I was commissioned to write, curate and promote articles for the Dataconomy platform in the months leading up to their annual Data Natives Conference in Berlin. During the three-day event, I facilitated workshops, interviewed keynote speakers and served as the moderator for the most popular stage at the conference, "Tech Trends." June 2017: All photographers, even very talented ones like Jonathon Davison need little ways of differentiating how they showcase their work – especially online. To that end, I created this illustration to demonstrate Mr. Davison's unique eye for capturing nature's more subtle personalities, and his knack for showing how when you stare out across a landscape, the landscape often has a tendency to stare back. February, 2017: Official logo design for Carbon Quest, a California-based technology company. Carbon Quest is pioneering energy-efficient carbon-negative methods of wastewater treatment for use by both public utilities and private firms. August 2016-June 2017: Contracted for the 2016/17 season by Maria Design to regularly develop original banners, web layouts, merchandise and illustrations for sale and use by Football Club Union Berlin; one Germany's most intensely celebrated soccer clubs. July 2016: The investors, business leaders, and non-partisan policy advocates that make up E2 support initiatives that are successful on both a financial and environmental level. While supporting California's SB 32, an effort to further reduce emissions, it was critical that they demonstrate how the state's previous climate policies are now helping grow the economy. For this purpose, I was commissioned to design evocative icons that would breathe some life into E2's fact sheets and emphasize key data points from their research in each of California's assembly districts. While in use among California legislators and landing on Governor Jerry Brown's Desk, these fact sheets are also available to the public. SB 32 successfully passed and was signed into law on September 8, 2016. June 2016: Logo and concept design for Potent Grow, an organic fertilizer company in service to budding growers in the Pacific Northwest. May 2016: Custom Illustrations for DJ duo Wolf + Lamb, based on their already well-established Love Train Tour aesthetic from Wolf + Lamb Records. May, 2016: Custom illustration for Marcy North's May 22nd rooftop event in Brooklyn. Fall, 2015 - Summer, 2017: Co-designed with multimedia artist Deniz Kurtel the official logo, promotional text, and digital presence for the NYC creative space and music venue, The Fifth House. The Fifth House functions as Deniz's studio, as well as a spot for private events and the latest Marcy Parties. I additionally provide regular logistical support and web curation on behalf of the space. The Autonomics: Video for "Nada Surf"
January 2016- July 2017: Savoteur is a travel and lifestyle publication that highlights cultural trends and unique getaway spots across the globe. I conducted research and wrote articles for their world edition and also served as chief writer for their Berlin edition. December 2015: Designed the official logo for Pacific Ag Logistics, a company specializing in the movement of agricultural products. Their parent company is Pacific Ag Solutions. December, 2015: Pacific Ag is the largest provider of comprehensive biomass in the United States. When they were putting together a new kind of employee award, they required something that could represent the attitude of their most resilient, resourceful, and at-the-ready people while also getting a few laughs. Using their homegrown concept of a "straw dog," I created an award icon inspired by the massive bales of straw that they so meticulously move around the country on a daily basis. Fall, 2015 - Spring, 2016: Created story-assisting infographics as part of an ongoing design project with Presidio graduate students in San Francisco. The focus is on developing icons and diagrams that aid verbal presentations of carbon reduction methods to local governments and the private sector. August, 2015: Visually demonstrating the uniqueness of an agricultural supply chain is not a straightforward task. When it came to Pacific Ag, the task was to highlight the landscapes as well as the unique colors of the regions where they both harvest and ship biomass in the United States. Using the geometric harmony of the very farmland itself, I created map-inspired graphics designed to evoke a sense of familiarity to local farmers while also projecting modernized efficiency to investors (Below: North Carolina, North Dakota, Kansas). June-July, 2015: Designed original characters and created logo concepts for the promotional efforts of the Berlin banner printing startup, Signways. May, 2015: Contributed original graphics to installation artist Stephen Bontly's custom light show for the DJ/producer Lunakid. The light show was designed for a show at the Berlin Music Video Awards, concluding the second day of the event. The original images below (among others) were sampled and rearranged for the live show. 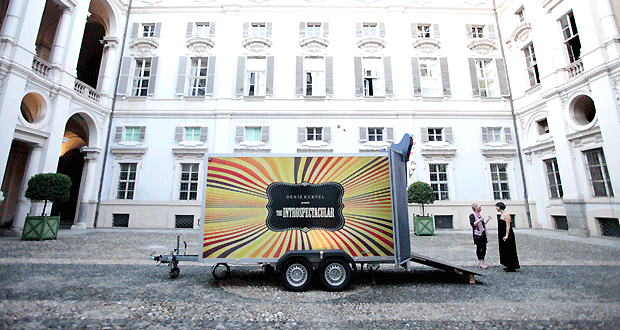 May, 2015: Designed and circulated the official flyer for artist Deniz Kurtel's interactive LED light installation, the Introspectacular , on the Berlin leg of its tour around Europe. April, 2015: Now a luxury condo, the Neu West Building once served as a home for squatters and artists in central Berlin. 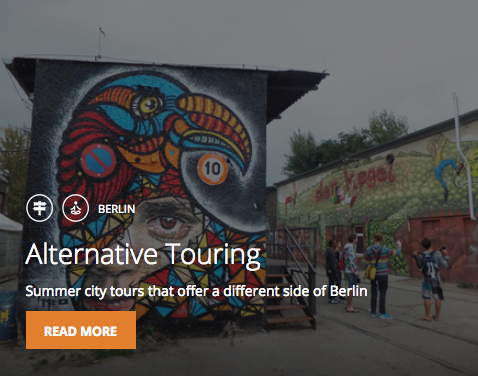 In the years after the fall of the Berlin wall and preceding most of Berlin's startup boom, the abandoned building hosted many experimental art exhibits, avant-garde dance performances and eclectic techno nights. I contributed a few surreal art pieces to two of the space's final events, both appropriately named "Zerstört" (German for destroyed) before all of the artists left for zanier pastures and a more upper-middle-class clientele moved in. Given the hedonistic nature of these 'exhibitions,' I tried in my own work to highlight the theme of destruction – symbolizing the end of the building's squatter culture, and, quite possibly, also the behavior of some of the event's more exuberant and existentially-minded attendees. February, 2015: Created concept art and designed original characters for the projects of web designer Ian Warburton. February, 2015: Designed original graphics for the main stage light show of Psy Lab, a Psy-Trance inspired music and art event. The light show and the very stage itself was designed, built and animated by installation artist Stephen Bontly. The project was done at the request of Noize Freqz, a Berlin-based event promotions company supporting independent record labels. 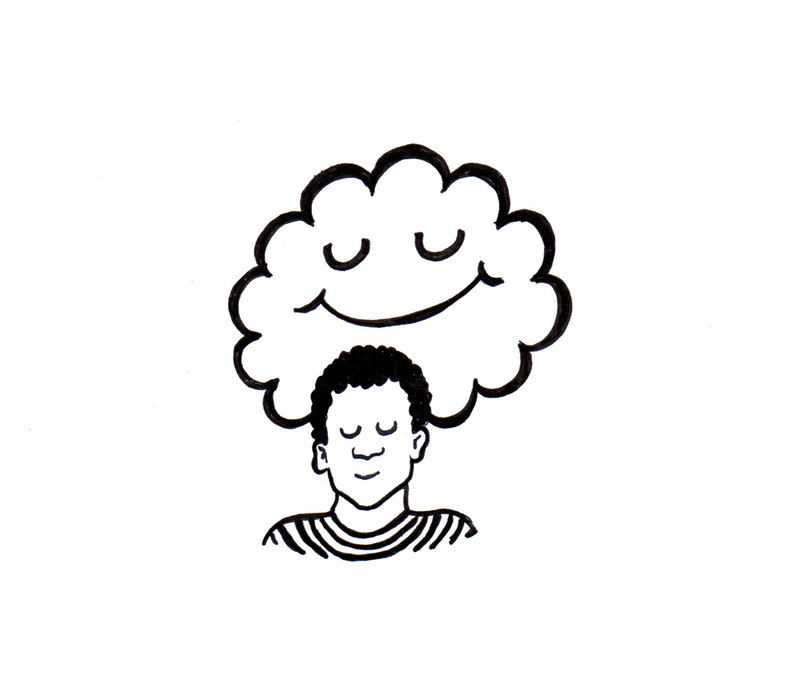 Book Illustrations: It's Your Mind - Own It! April, 2013: Work designed to accompany the blogs of marathon swimmer Dave Van Mouwerik. Showed how Dave's perception of Lake Siljan as a Nordic monster framed his mindset while swimming across it. August, 2013: Designed the logo, layouts and visuals for Upstream Ideas, a blog that analyzes current events. Back in 2007, I won my high school's class of 2009 T-shirt design contest by fusing some popular album art with school colors.